Howdy Partners! Have you been trying to advance articulation, problem solving and literacy skills with your students? If so, maybe you would like to gallop on over to our blog in order to get the link to download our freebie called Wagon Wheel Words? We have included worksheets that come in four difficulty levels so that you can target the articulation of sounds and also work on advancing spelling, writing, reading, naming, and problem solving with a large variety of students, all at the same time! Students love these wagon wheel word problems! 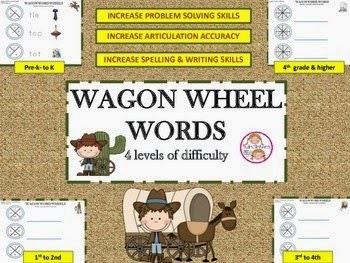 They are given the opportunity to try to figure out what word is written in a the wagon wheel by either going clockwise (on the first three levels) or going either clockwise or counter clockwise (on the fourth level). After they figure out the word, they are asked to write the word on the line and they always seem super proud of themselves when they figure them out! Each wagon is a little problem to solve and the little Cowboys from the ages of Pre-k to 8th grade that we trialed them with at our speech clinic enjoyed solving them all! What's better than having a child advance in their language and literacy skills, as well as, in their articulation skills in one session?! Follow our blog and facebook page. It would be fantastic if you did!